For freshman forward Gemma Cirera, becoming the first Quinnipiac women’s field hockey player to come from Spain is just one of the many things she’s done. Cirera’s journey to the turf went through the classroom, the dance floor and the waters of Galicia—all while learning English as a second language. And at times, it hasn’t been easy. Cirera was born and raised as an only child with her father Josep Cirera and mother Sara Gutierrez in Terrassa, Barcelona. As part of the curriculum in her area, students had to play as many sports as possible. “When I was little, I played five sports a week,” Cirera said. 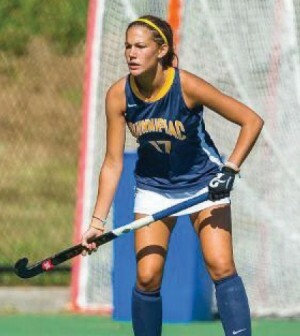 With many sports at her disposal, Cirera was introduced to field hockey by her parents at a young age. It was not long until she made field hockey her primary sport. Although Cirera chose field hockey as her major sport, she continued to stay involved with her other passions. Along with competing in hip-hop, she also tested her individual talents on the beach. Cirera participated in an amateur surfing contest in Galecia on the east coast of Spain one summer. Despite taking time away from field hockey to test the waters of other sports, Cirera found some transferable skills to take to the turf. Over the years, Cirera has competed in field hockey across Spain in the Catalonia State Championship, the Spanish National Cup and the Spanish Honor Division. In the Catalonia State Championship, she battled against many familiar foes. The wealth of talent in Spain did not go unnoticed by Quinnipiac women’s field hockey head coach Becca Main. Main said conference opponent Rider always had good Spanish players on its team. Because of this, Main went on her own search to find a suitable Spanish player. In her first season on the team, Cirera admitted that some of the adjustments to a new school and country have affected her play on the field. “Personally, I think I am not doing my best because it is so hard to come here with a language that you do not know,” she said. Cirera is also trying out a new position this year. She now is a forward, instead of a defender. Main said communication is the prime reason for the switch in position for Cirera. Despite the struggles, Main has seen improvement in Cirera’s early career at Quinnipiac. Along with balancing field hockey and the adjustment to a new country, Cirera is pursuing a major in film, video, and interactive media. Cirera is enthusiastic about the opportunities for FVI students in the school. As the season comes to a close, Cirera looks to continue making a full adjustment to life at Quinnipiac.